Winger Braydon Ennor grabbed four tries and fullback George Bridge a hat trick as Canterbury overwhelmed Southland 78-20 in a Ranfurly Shield challenge in Christchurch today. 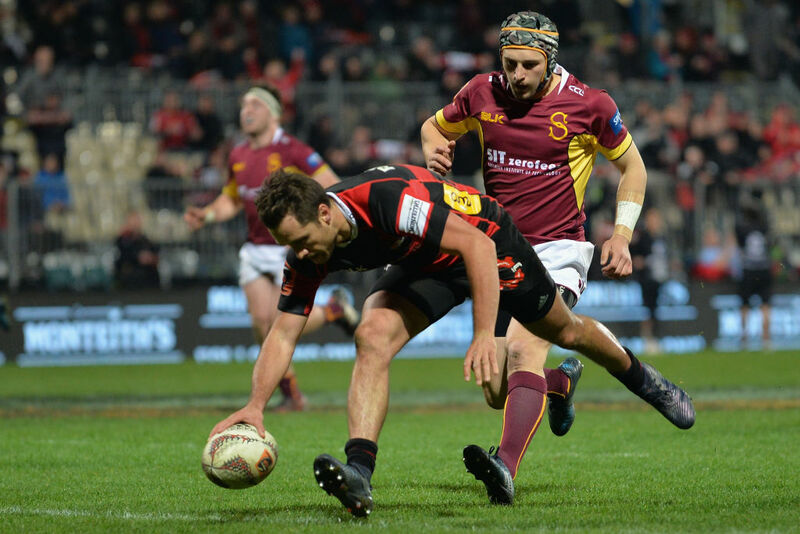 All up, Canterbury racked up 11 tries in a match which also doubled as an NPC cross-over match, cantering away with the second half 61-3 to continue their unbeaten run at the top of the premiership. Richie Mo'unga ran riot for the red-and-blacks in the opening 20 minutes, Canterbury clearing out to a 17-3 lead and looking in complete control. Mo'unga nailed an early penalty, then finished off a Tim Bateman break in the 10th minute give the home team 10-0 lead. Canterbury's dominance at the breakdown and patience in building phases paid dividends in the 22nd minute, Dominic Bird featuring with a strong carry before a quick recycle left Mo'unga with the easiest of finishes. Southland hit back in the shadow of half-time after finally generating some front-foot ball with more players attacking the breakdown. Winger Junior Ngaluafe then centre Neria Fomai crossed within the space of three minutes, and Scott Eade added two conversions to an earlier penalty to level the scores at 17-17 going into the break. Canterbury barely paused for breath from the restart, Ennor bagging his first two tries inside the first four minutes to restore a comfortable lead. Not to be outdone, Bridge grabbed the next two, the first set up by quick ball from halfback Mitch Drummond and the second from a superb through kick from Tim Bateman. Southland's cause wasn't helped by Ryan Tongia's sin-binning for a shoulder charge on Mo'unga in the 54th minute, Canterbury crossing twice in his absence. The tries came thick and fast right to the final whistle, Josh McKay and Bateman book-ending two more from Ennor and a third from Bridge as Canterbury ran in nine tries in a second-half rout.